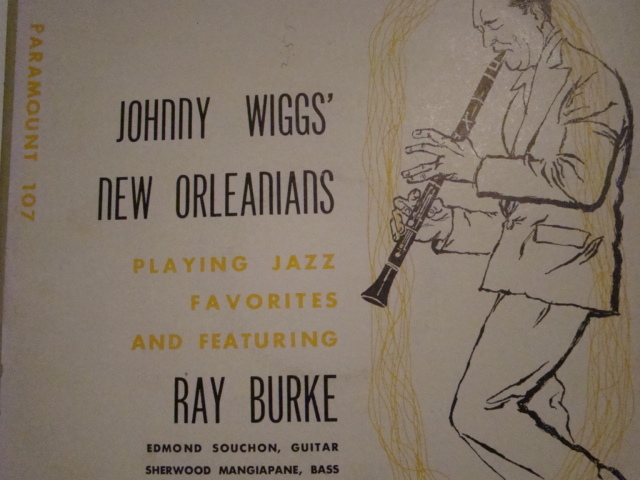 The recordings that cornetist Johnny Wiggs, clarinetist Raymond Burke, guitarist / singer Dr. Edmond Souchon, and string bassist / singer Sherwood Mangiapane made in two sessions in New Orleans (in 1952 and 1955) have been both glorious and elusive. Issued on two ten-inch microgroove recordings on the even more elusive Paramount and Steiner-Davis labels, they were wonderful yet invisible. I first heard some of this music on a cassette copy made for me by the late Bob Hilbert, and I knew much more existed but had never heard it. A year ago, I saw one of the records on eBay at a low price and (atypically) was able to buy it without eroding my savings. I thought the front was very impressive. But this is a post about music, not about record collecting, so I hope my digression is pertinent here. I should say that the sessions were originally envisioned by collector / archivist / scholar John Steiner as trios — clarinet, guitar, bass — echoing the recordings of George Lewis that William Russell had made earlier. Russell agreed to record the Burke-Souchon-Mangiapane trio, but — happily for us — Johnny Wiggs came by with his horn and the group became a quartet. The two vinyl issues collected sixteen performances. I — and no doubt others — have been waiting, hoping for this music to be effectively issued on compact disc. And it happened! 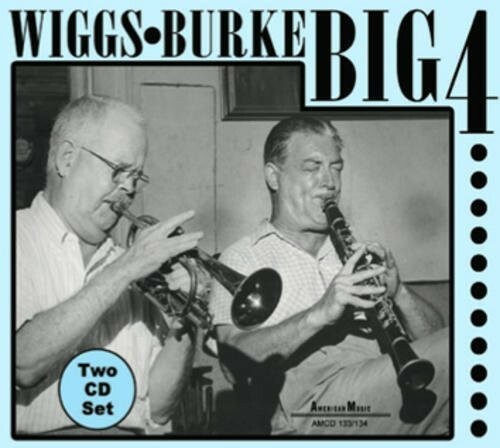 The American Music label has issued a two-disc set of the WIGGS-BURKE BIG FOUR. Not only does it offer the original sixteen tracks but a good many alternate takes, performances that didn’t make the original issues, and three tracks from 1957 that bring together Burke, Wiggs, Souchon, Art Hodes, and Freddie Moore. On one or two tracks, Raymond plays the harmonica (not a high point in recorded music, but we needed to know about it, and a tin flute. Wise notes by the deeply-involved Butch Thompson and some rare photographs make the set complete. The recorded sound is fine and the discs are well-programmed, so each disc sounds like a small rewarding session on its own. The songs are (asterisks denoting a title with more than one version) PUT ON YOUR OLD GREY BONNET / ALL NIGHT LONG* / AT SUNDOWN / BUDDY BOLDEN’S BLUES* / MEMORIES / RAY’S TUNE* / CONGO SQUARE / BUCKTOWN BOUNCE / I CAN’T USE IT / IN THE SHADE OF THE OLD APPLE TREE / HOW COME YOU DO ME LIKE YOU DO? * / MAMA’S BABY BOY* (a/k/a DO WHAT ORY SAY) / ALL THE WRONGS YOU’VE DONE TO ME / MILENBERG JOYS / POSTMAN’S LAMENT* / BLACK SNAKE BLUES / SMILES / SINGIN’ THE BLUES / SPANISH TINGE* / HARMONICA BLUES / WALKIN’ THE DOG / TULIP STOMP (a/k/a WHEN YOU WORE A TULIP) / DARKTOWN STRUTTERS’ BALL / GOING HOME / CHINATOWN / JUST A LITTLE WHILE TO STAY HERE / BABY WON’T YOU PLEASE COME HOME? / JOHNNY’S BOUNCE / BUCK TOWN / HEEBIE JEEBIES / MAKE ME A PALLET ON THE FLOOR / SISTER KATE / TIN CAN ALLEY / UNKNOWN TUNE / CITY OF A MILLION DREAMS. Here is Jazzology Music (the GHB Jazz Foundation): the primary site where the discs can be bought — and if you notice the Index, bottom right of the page, with a careful scrolling motion you can hear the WIGGS-BURKE BIG FOUR play PUT ON YOUR OLD GREY BONNET. If that doesn’t convince you, I don’t know what will. I don’t usually become hyperbolic and tell my readers that this is “the one disc they must buy,” “the one festival they must go to,” etc., because there is so much enticing and enduring music both being reissued and being made live even as I write this. Yet I think that the WIGGS-BURKE BIG FOUR has given me an extraordinary amount of the pleasure in the months that I have had and played it . . . and played it. And I certainly think that the musicians who think of themselves as “traditionalists” and beyond should be listening intently to this music for its lightness, its depth of feeling, and its expertise. Let me explain. Although I don’t identify myself as purely a New Orleans jazz aficionad0 (in my mind, the Armstrong Town Hall Concert, Jones-Smith Inc., the 1938 Basie band, the Goodman Trio, the 1940-1 Ellington band, the Keynotes, the Vanguards . 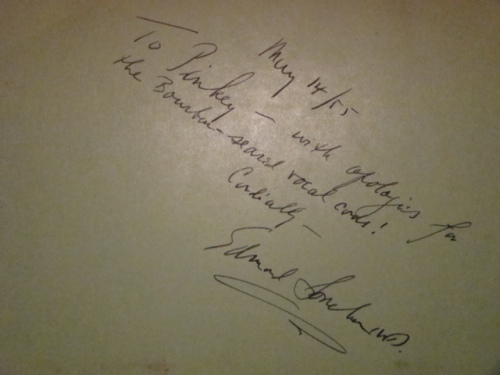 . . all have their assured places in my affections) but I do love collective improvisation as a musical way of life. In fact, some of my favorite moments in hearing / video-recording live jazz in 2013 are provided by those groups that understand their existence as BANDS — improvising, creating backgrounds, playing riffs, working as ensembles — whether they model themselves on Bunk’s Last Testament band or much more “modern” in their approach. Wiggs, Burke, Souchon, and Mangiapane very occasionally present themselves as a single-soloist-with-rhythm; more often, we hear four sweetly idiosyncratic voices going their own ways while fulfilling their roles as members of a band. So “there’s always something going on” to interest a close listener. The great voices on this disc are paradoxically the sounds that come through Burke’s clarinet and Wiggs’ cornet — sounds I found endearing as soon as I heard them, years back. Wiggs heard Joe Oliver in the flesh in the very early Twenties and was impressed by the King for the rest of his life — thus he has some of Oliver’s terse power. But he also heard Bix, and I think the latter’s lyricism won out: Wiggs (although not as harmonically ambitious as Bobby Hackett) captured something of Bix’s brief epigrammatic ways: a Wiggs phrase is like a great, sometimes sad, utterance: it hangs in the air the way a Joe Thomas phrase did, and we are musing over its meaning while he is eight bars away. In his own fashion, Wiggs is a great sad poet: his melancholy is always lightened by his joy in the rolling rhythms beneath him, but his sound is autumnal, dark red and gold. Burke, for his part, can at first sound like an elliptical version of the great New Orleans clarinetists — I am thinking specifically of Ed Hall, of Bujie Centobie — but he has his own phrasing and his own, always surprising sound. And, just in passing, I must say that the most famous group with this instrumentation was the Bechet-Spanier Big Four of 1940, but the Wiggs-Burke quartet is far more easy, less pugilistic. Friends playing for their own enjoyment, weaving melodies for the sake of song, not musicians out to show who’s boss of the session. Why my title? The music on the WIGGS-BURKE BIG FOUR discs suggests a kind of informal play among friends that very rarely takes place in a recording studio — more often in a living room or on a porch when only the musicians and their friends are there. Certainly this would be a perfect set of CDs for a backyard party . . . sweet melodies in swing. Posted in "Thanks A Million", Bliss!, Generosities, Ideal Places, Jazz Titans, Mmmmmmmmmmmmm!, Pay Attention!, Swing You Cats!, That Was Fun!, The Heroes Among Us, The Real Thing, The Things We Love, Wow!